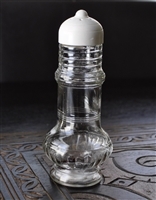 Tall Industial style salt or pepper shaker with original top. Porcelain rabbits salt and pepper shakers set. Vintage USA 82 mixed fruit salt or pepper shaker. White and blue elephants small salt and pepper shakers. Vintage Japanese porcelain salmon or trout shaker. Vintage set of two pressed glass salt and pepper shakers with metal tops. Ball point, Retro rocket style U.A.Kasin Molded salt and pepper shakers and two red shakers. Vintage amber glass salt and pepper shaker from Japan. Porcelain shakers George and Martha Washington. Thrifco Japanese porcelain Oklahoma State decorated set of shakers. Gingerbread man vintage Japanese shaker. Vintage porcelain salt and pepper shakers President and Mrs. Gerald F. Ford. Vintage teapot salt and pepper porcelain shaker with my house and quest welcome notes made in Japan. Nate Berkus metal LIONS salt and pepper shakers set. Large Rooster porcelain Shaker, very cute. Vintage Japan, porcelain Dog playing instrument shaker. Dokey porcelain salt or pepper shaker, Japan. Metlox pottery pepper shaker with stopper. Amber glass geometrical vintage shakers lids worn. Boy and Girl porcelain salt pepper shakers German/Austrian costumes. Vintage Fold Art wooden salt and pepper shakers from USA and Mexico in this handmade display. White and blue Urns salt and pepper shakers, Japan. Fun cabbage heads salt and pepper shakers set. 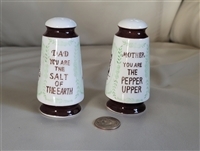 Mom and Dad commemorative salt and pepper shakers, Japan. VIntage silver tone metal salt and pepper shakers set. Wizard of OZ Glinda salt or pepper shaker in porcelain.